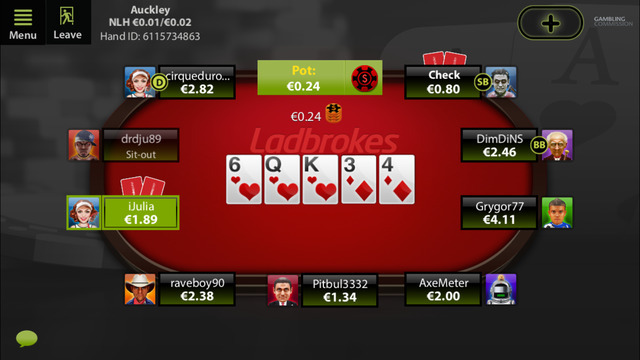 Ladbrokes are one of the biggest online poker rooms in Europe. 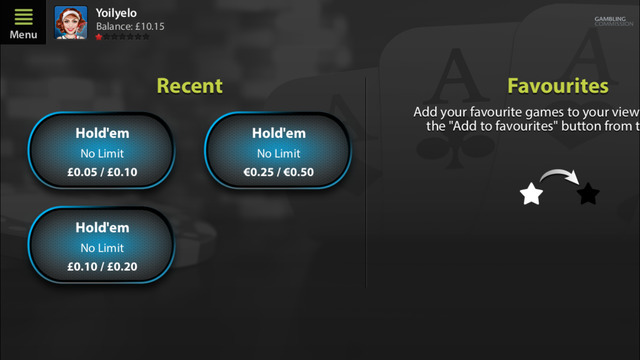 They've now released a poker app that works on any iOS or Android device. 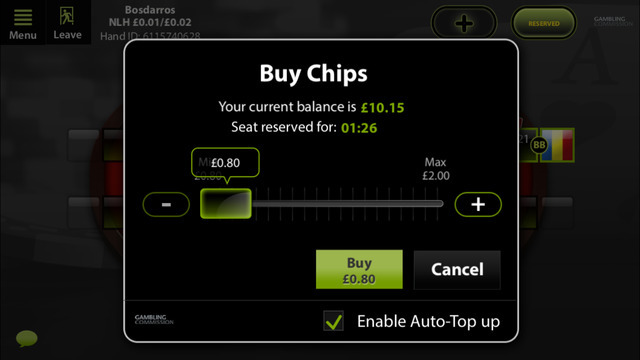 The Ladbrokes poker app supports speed poker and multi-tabling on tablets and smartphones. Play Texas Hold'em cash games on mobile devices. Play for real-money with stakes from 1c/2c to €2/€4. High-speed fast fold games or regular speed poker. Play Texas Hold'em on up to 4 tables simultaneously. Ladbrokes Mobile does not currently offer tournaments. Ladbrokes are one of the oldest and most well known gambling companies in the world. The company’s heritage lies deep within the sports betting industry, but they are much more than just a sportsbook these days. Their integration into online poker saw Ladbrokes become one of the go-to places for players from around the world. These days it’s pretty fair to say that they don’t have the market share they once used to, but nevertheless, they are still a force to be reckoned with. Their recent affiliation with mobile poker brings us to this review and throughout it we will be looking how their poker app performs on the ever-impressive Apple iPhone. First impressive of the Ladbrokes poker app for iPhone is that there isn’t an awful lot going on. You are instantly taken to the lobby with what seems like few options. We’d suggest that your first port of call to be to check the menu button found in the top left hand corner of the screen (note that the app can only be used in landscape mode. Here you will be able to check the status of your deposit bonus, VIP level and change any in-game settings to make things run a little smoother. Also if you have any queries regarding your account then this will point you in the right direction. The rest of the lobby is broken down into two categories; cash tables and speed games. Unfortunately there are no tournaments on offer from the mobile sector just yet, although Ladbrokes do report that this is something that they do hope to include in the future. The cash table section will allow you to choose your game type, bet type, currency, stakes and table size. One of the downsides to the app is that you can only play Texas Hold’em as your game type. Whilst this will likely be enough for most players as it’s the most popular game type, for those who are looking to mix it up a little will need to look elsewhere. You do get the ability to play in both Euro’s and GBP, which is a nice touch. Table stakes range from 1c/2c to €2/€4, which is a reasonably good range. The higher stakes players will again need to look elsewhere, however! The games range between heads up, 6 max and 9 max, but we must mention that all stakes seems to get a really good amount of players. Even when checking at off peak times the games were always busy with hundreds of players at each level kicking about. As you moved up the stakes the number of players did drop off somewhat but never to the point where you couldn’t get a game. You’ll get the option of choosing between taking a seat immediately and letting the app sit you at a random table with the stakes and game type you’ve selected or you can be a bit more meticulous and scroll through the tables so see which games look juicy. If you are heavy into table selection, then this will be a really nice feature for you. The tables look really smart, even on the limited space of the iPhone. If you have a 6+ then you will be at a huge advantage but even our testing carried out on the 5s showed that there was plenty of room. The games at 9 max tables did feel a little more cramped than the 6 max games though, but were more than manageable. The design is slick with the red and black of the table contrasting nicely with the green highlights to indicate it’s your go. The buttons weren’t too small either, which is a common problem for iPhone poker rooms and we found selecting raise amounts to be easy enough, even for cumbersome fingers. The competition will be pretty broad at Ladbrokes. The lower stakes games will be about as diverse as you like with people just going totally insane to absolute nits. As you move up the games do get tougher but we wouldn’t say the overall standard was particularly high. We would warn you about heads up tables though as there are a lot of regulars, especially at 50nl and above. 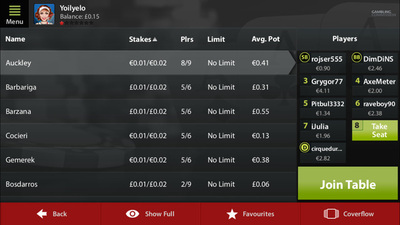 One of the best things about the Ladbrokes app is that it’ accessible from the App Store. It’s simple to find and a quick search of ‘Ladbrokes Poker’ shouldn’t see you too far wrong. If you can’t access the app store for whatever reason then you can access the link to the download directly from the Ladbrokes Poker site. Just scan in the QR code and you will be away. The deposit bonus is also about as good as you are going to get. They actually offer a whopping 200% bonus on your first deposit into the Ladbrokes Poker room which can be redeemed by playing poker on your mobile. The bonus is worth up to £1,200 which means you only need to deposit £600 to get the full amount. Once you’ve made your deposit your bonus will be attached to your account and you can start earning immediately. It will then be released into your account as you accumulate Status points, which you will receive when you play at any real money game from the site. You will get 90 days to clear your bonus and it will be released in increments of £5 for every 240 point earned. What you’ll find from Ladbrokes is a really polished poker app. But, it does come with a few downsides. The limitation on the games that you can play is something that a lot of people will be aggrieved by. The general consensus is that it includes at least an Omaha option to accompany Texas Hold’em, coupled with the lack of tournaments is something that Ladbrokes really needs to address. Apart from that, the app is very good, with the design and functionality being the standout features. It’s never easy to accommodate the limited iPhone screen (unless you have a 6+), so we understand that making this work is tough. Overall they do a very good job, as you would expect from one of the most reputable companies in the industry. Read these other poker app reviews.